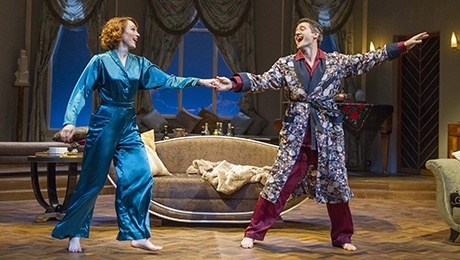 Noel Coward's classic play Private Lives is touring the UK, calling in at Birmingham's New Alexandra Theatre from February 8 to 13, 2016. 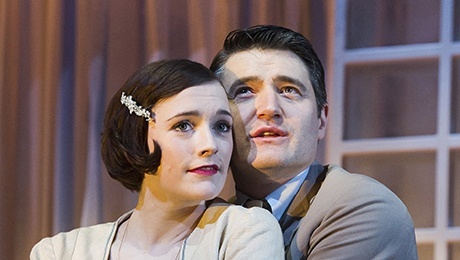 It stars Tom Chambers as the lovable and charming Elyot, Charlotte Ritchie as his new wife Sybil, Laura Rogers as his ex-wife Amanda and Richard Teverson as Amanda's new husband Victor. Written in just three days, Private Lives is Coward's greatest success and is a masterpiece of 1930s comedy. Divorced couple Elyot and Amanda meet again on their honeymoons with their new spouses – and what follows are heated rows and passionate reconciliations, razor sharp wit and sparkling dialogue. 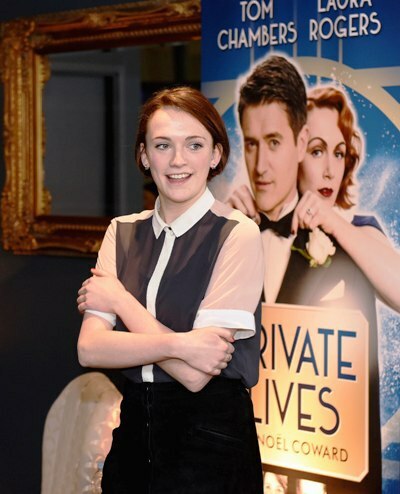 Charlotte Ritchie is currently starring on our TV screens every Sunday playing Barbara Gilbert in Call The Midwife. The 26-year-old has also starred in Fresh Meat and Siblings and was a founder member of classical vocal quartet All Angels. 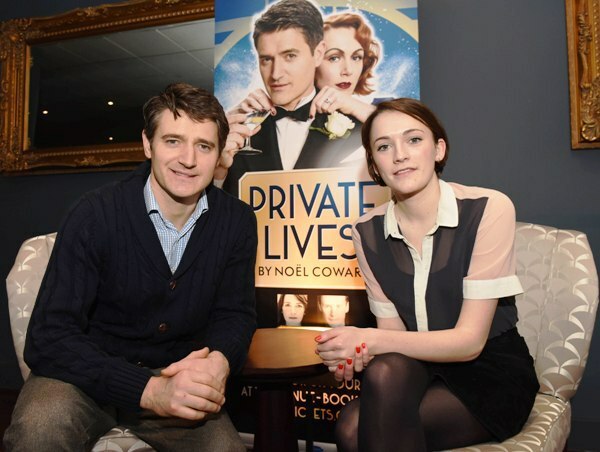 I caught up with her for afternoon tea during the Birmingham launch of Private Lives. Am I right in thinking this is your first full theatre tour? It's my first tour and second ever professional play. My first play was One Night in November at Coventry's Belgrade Theatre. It was about the bombing of Coventry in the Second World War and the theory that Churchill knew that Coventry was going to be bombed but didn't tell anybody. What attracted you to Private Lives? I knew it was classic writing, the storyline sounded wonderful and hilarious. The biggest draw was that we were going on tour. 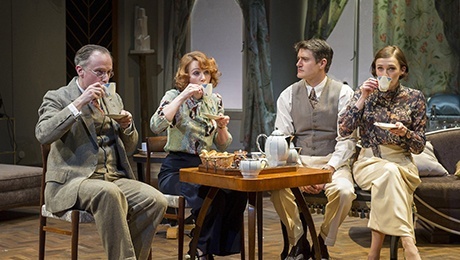 I knew that both the director Tom Attenborough and Tom Chambers had done some great stuff and I loved that they were taking a well written play with really great actors on tour. There is so much theatre in London but there are not enough tours and I was really excited to get some experience outside of London, where audiences are so appreciative of good theatre but don't get as much as they should. How does touring with a theatre company compare to touring with All Angels? With All Angels we did a lovely cathedral tour, that's probably my favourite thing I've ever done, but we didn't get to spend long in each place, that's the big difference. It was a night in each place, and we did lots of radio tours as well which were so much fun. I saw gorgeous parts of Scotland – we went to Ayr just to do a quick interview and that was a real privilege. With Private Lives we get a week in each place so already we've savoured the delights of Stoke-on-Trent – we went out on a students' night last night. It was quite by accident. We went to a bar and it happened to be students' night. I felt quite old, actually, but I still think of myself as a student! We're hopefully also going to the Peak District and when we're in Birmingham I'm hoping to go to the Black Country Living Museum. When are you going to be in a musical in the theatre? I don't know, it depends what the musical is. I like specific musicals, like the Carole King musical where you get to sing songs by singer-songwriters that you love. But it depends on the production. I think that the thing that intimidates me slightly about musicals it that they are massive and I heard that you have to follow the choreography of the original director which I would find difficult. I'd like to do one in a small theatre, maybe with a new writer – or a Sondheim which I just fall for anytime. Or West Side Story. Really classic writing would be great. I watched some videos from Top Hat and I was just so in awe, it was so cool. He appears to be like a lovable fool and then you realise that he's really, really good and really, really talented. He's incredibly low key; he's won some amazing awards and done 500 performances of Top Hat but he's so unassuming. I think it nearly finished him off, it sounds pretty epic. Are you a dancer as well? I'm a freestyle dancer! I'm not very good at choreography. I like to say it's more important to express yourself freely! Both Tom and your Call The Midwife star Helen George have been contestants on Strictly Come Dancing. Helen is just incredible. It sounds so patronising but I'm so proud of her because Call The Midwife is such hard work and she did that and Strictly at the same time. She's very low key but she stole the show and should have won, I can't believe she didn't. Before I joined the cast I was a big fan of Call The Midwife so I was slightly starstruck. But Helen was so relaxed and so welcoming. 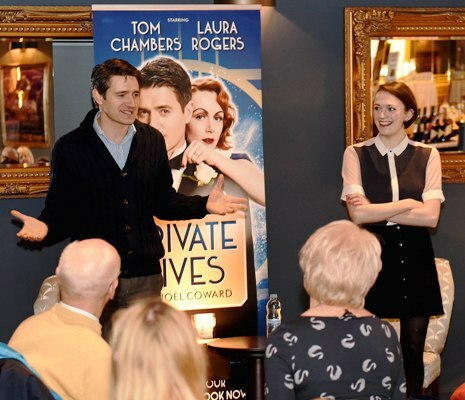 What are your plans when Private Lives finishes its tour? I'd really like to go on holiday. I'm thinking Canada or Iceland. I'd like to take about five months off and go travelling around the world but I feel that might be foolish because there's lots of nice stuff going on. I'll be filming the next series of Call The Midwife and that's a big chunk of time, May till November, so that keeps me out of the running for lots of other things. That's fine by me because I think I'll look back on Call The Midwife as one of the things I'm most proud of, so if I get to do another year of that I'll think that's pretty good. March 14 - 19: Theatre Royal, Bath.